Weslo is known for making some of the most affordable yet defined fitness equipment, and the Weslo CardioStride Treadmill 3.0 is yet another one of its notable offerings, which is not just affordable but can provide you with effective workouts in the comfort of your own house. This machine is user-friendly and anyone who wants to improve his fitness and health will benefit enormously from its simplicity. The belt flows smoothly, like riding a calm sea, and this naturally translates to minimized jerks and gives a regular stride length, something you would get from power walking outside. Moreover, you can keep track of the calories you burn from the LCD window. A tight budget is no longer a reason not to be fit. Now, you can have your own gym at home. 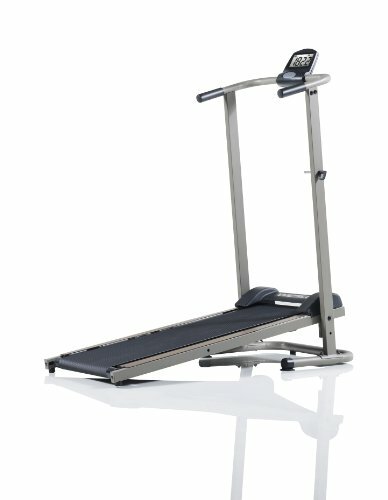 The Weslo cardio stride treadmill has a unique design that makes it a space saver. It is easy to fold vertically and store safely away when not in use. Any little sound heard from the belt of Weslo Cardio Stride 3.0, could possibly mean a lubrication issue, that is dealt in the manual thoroughly enough. However, the sound does not in any way disrupt any normal activity in your home such as watching TV or listening to music. The 15 percent fixed incline tightens your muscles better than flat walking. The LCD window displays all the information you need as you keep track of your progress. You always know how many calories you are burning. You are informed of your speed, time, distance, and your pulse. This cardio stride treadmill is the perfect workout for anyone, most specifically for those who want to lose weight because it can take up to 250 pounds maximum weight capacity. Weslo CardioStride Treadmill 3.0 is rare because of its manual mechanism. Obviously this means it lacks a motor but instead of making life harder, we felt the natural inclined state and its mechanical nature pushed us harder and every workout session started becoming more than just a test – it really does bring a lot of muscle groups into play! Lack money yet want something decisive? Get the 3.0 CardioStride and be the horsepower for your conditioning. Like most manual treadmill, you have to grasp the handrails as you run or walk to keep from falling back. This is because the treadmill is on a fixed incline. Working out on Weslo CardioStride 3.0 is more difficult than working out on a motorized treadmill but it can turn out better for you, as mentioned previously. It is so easy to set up the cardio stride manual treadmill, taking just around 30 minutes, which I must say is amazing considering the mechanical heart. Weslo CardioStride 3.0 has a 17-by-41-inch belt. It rolls smoothly but it is not long enough for taller users to walk or run. It works well with proper lubrication but it still emits a bit of a noise when you start pushing harder, but not to worry no motor parts to break here. Unfortunately, the lack of weight does mean that the front is lighter than the back and this can topple it over if one’s not careful about getting too close to the top of the incline. Its low price is the sole reason many shoppers are attracted to this manual treadmill and the fact that it is not operated by electricity helps cut down on maintenance and overheads. It provides the users with a fitness or weight loss workout that they need and at the same time, stays within budget. This inexpensive, compact cardio stride manual treadmill is perfect for people on a budget and who live in small apartments or condos but other than that there isn’t anything truly spectacular about it. The machine has a fixed 15 percent incline, which can increase calorie burn and reduce joint impact. It features a SpaceSaver design that folds vertically for storage and minimizes workout space consumed. It includes an LCD display, which keeps track of user’s speed, time, distance and calories burned. The walking treadbelt is 17” x 41” designed to operate smoother and quieter than an average treadmill. This treadmill can accommodate users weighing up to 250 lbs. It is a lightweight and portable treadmill, features a design that folds vertically for easy storage when not in use, manual operation. It is a bit noisy and has a small belt size which is definitely not suitable for taller or wider folks with a long stride, inconsistent read outs. The Weslo CardioStride 3.0 is a budget treadmill, therefore some setbacks are to be expected. However, those looking primarily for an inexpensive, compact manual treadmill will feel that they got their money’s worth. This is the perfect treadmill for those who want to get fit and healthy at a reasonable price. It is easy to assemble, easy to use, easy to stack away after each workout, and very easy on the eyes too.